Alfresco 3 Cookbook: Quick Answers to Common Problems by Snig Bhaumik is the latest book from PACKT Publishing about the Alfresco Open Source Enterprise Content Management System.(CMS). The book is now complete and is available in both print and electronic format. Prior to the book being completed, parts of it had been made available earlier by PACKT in a pre-release RAW format. When I heard about this book, I was immediately interested. The concept of having a cookbook-style reference book filled with easy-to-follow self-contained recipes for how to perform common tasks in Alfresco is very appealing. Each of the sections or 'recipes' is then broken down into a brief description of the task followed by a sub-section titled "Getting Ready" and then another one titled "How to do it...". There's also an occasional "There's more..." section that contains a more in-depth explanation for why or how something works. The "How to do it..." section is the heart of the recipe and it breaks down each task into step-by-step instructions for how to complete it. The text descriptions are very clear and there are many illustrations, mostly of UI screenshots. I like the cookbook style the book uses -- this book is part of PACKT's cookbook series. But to stay true to the cookbook format, I would have preferred a larger number of recipes with shorter discussions about the background mechanics for how any one particular recipe works. Some of the recipes are a bit long and stretch to as many as twenty pages. The book starts out by describing the Alfresco installation process and then discusses topics useful to end users and administrators. In this part of the book and even in some of the later chapters, while I liked the overall style of presentation and format, it felt like there was a lot of overlap with material already covered in other places like Munwar Shariff's book Alfresco 3 Enterprise Content Management Implementation or even with what can be found in the standard Alfresco documentation. I would have liked to have seen more 'tips, tricks and gotchas' that go beyond just that material. Chapter 12 had me a bit puzzled. That chapter discusses integration of Alfresco with Microsoft applications and has a lengthy discussion of Alfresco's MS-Office 2003 plug-in instead of discussing SharePoint protocol integration. I may be wrong, but I had been under the impression that the Office plugin for Alfresco has been problematic and doesn't support Office 2010. The main caveat that I have about the book though is its focus on the use of Alfresco's older Explorer client. Alfresco Share is only mentioned on a couple of pages early on in the chapter that describes installation. I would have liked to have seen much more about Share. I think that almost all new deployments of Alfresco today will want to use Share as the web client, not the older Explorer client. 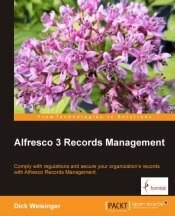 So, in general, I thought this book was well written and I think that you'll find a lot of useful facts about Alfresco here. I also find the cookbook format used by the book very appealing. But you'll likely be disappointed if you're looking for a book that covers Alfresco Share. I expect that PACKT has some books in the works on Alfresco Share coming up. In the near term though, there is a good overview discussion on Share in the latter part of Munwar's book that I reference above. ** I'd like to thank PACKT Publishing for making available to me a complementary copy of this book for review.